You may remember that earlier in the year Nola and I were chosen to be brand ambassadors for Turtle Tots. I was excited to become an Ambassador for the brand as I am a firm believer that swimming is a life skill, so the earlier you start the better! We started our lessons in May and did about three weeks worth before Nola was prescribed steroids for Infantile Spasms. Her consultant told us that within a few days her immune system would be suppressed making it easier for her to pick up bugs. He also told us that if she had contact with anyone who developed chicken pox she would need to be admitted to hospital. Cue paranoid mum syndrome! But in all fairness it was certainly justified! Armed with the info from her consultant I made the decision to avoid public places as much as possible which obviously affected our Turtle Tots lessons. Turtle Tots were understanding of our situation and kindly agreed we could pick up with our lessons again when the steroid treatment finished. Back to the start of our lessons in May! We were actually late for our first lesson due to bad traffic, by the time Nola and I were changed the class was 10-15 minutes into the lesson. The class teacher Lyndsey asked if we wanted to watch as we'd missed the beginning but I was keen to get in! As I'd expected Nola was absolutely fine getting into the water. She was very happy to be involved in the activities even though this was the first time she'd been in a swimming pool. In those first few weeks back in the summer she didn't protest once about being in the pool! She was fine being dunked under the water too, I think it's us parents that worry more about things like that! It was such a shame we had to postpone the lessons as we were both really getting in to them! When we returned to our lessons in October Nola was certainly more wary, being that much older and aware made a difference! Our lessons begin with the class teacher Lyndsey taking Nola as I get into the water. We then usually bounce around in a circle with the other parents and babies singing a song. It's a nice way to ease the babies into the water and makes it fun. On our first lesson back Nola probably cried for half of the lesson but we powered through! We were reassured by Lyndsey, who was understanding and always encourages us parents to go with what our babies want to do. Nola had lots of cuddles throughout the first half of that lesson but fortunately had settled in to the pool for the final half of the lesson. 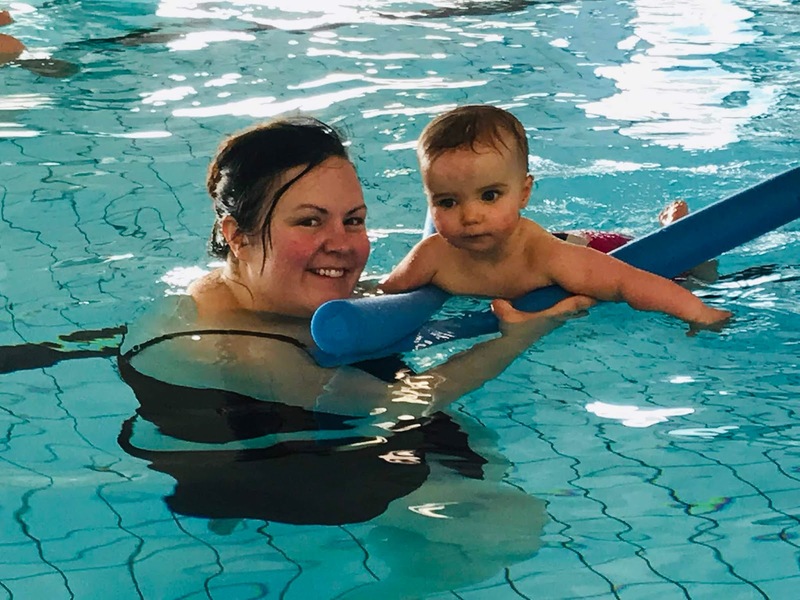 Each week the lessons follow a similar routine which is obviously important in helping your baby become familiar and relaxed with their swimming lessons. 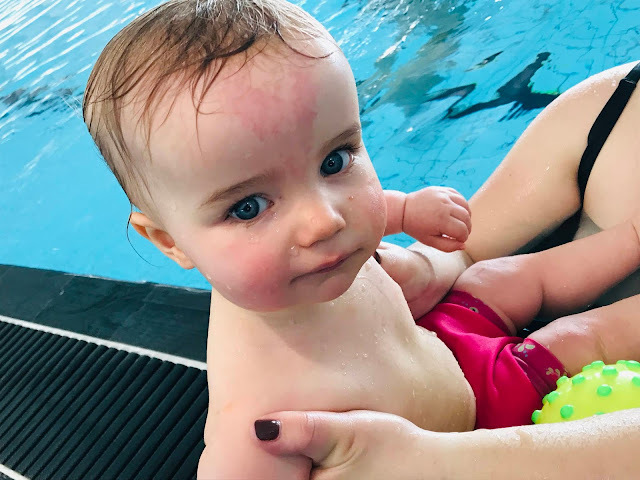 Once babies have settled into the pool after some singing and moving around, we get them used to water on their face which helps them prepare for going under the water. The same phrase is said in each lesson to enable babies to understand what is going to happen next. Parents will say 'mummy/daddy ready go' and pour water over their head before saying their babies name and doing the same to them. Nola hasn't minded the water being poured over her which is interesting as she is not a fan of having her hair washed! This activity gets the babies geared up for their 'peek-a-boo' swim. Parents always do the under water activities first, showing their little ones its fine to get your face and hair wet. The 'peek-a-boo' activity begins with the parent saying 'mummy/daddy ready go' before putting their face in the water and then doing the same with their baby. It's easy to the progression throughout the lesson! The first week back I didn't put Nola under the water, Lyndsey is always flexible about this and always reassures parents it's ok if we don't want to put our babies under or if they're having an off day. There has been no pressure that the babies must do every aspect of the lesson, it really has been 'a go with the flow' vibe which has been great. 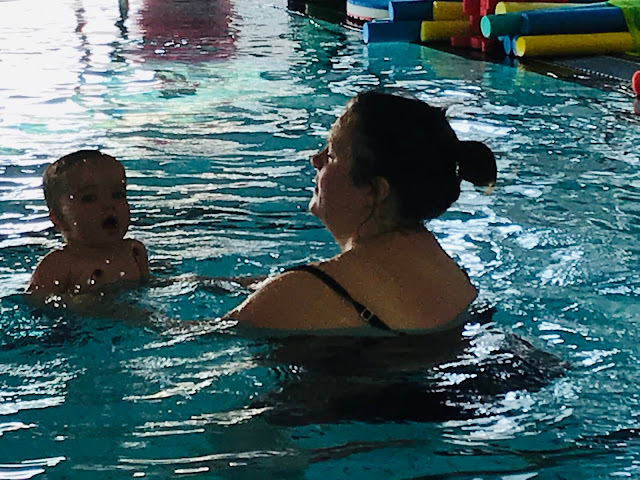 The lessons normally continue with more singing and fun activities which aim to instill those early basic swimming skills, such as leg kicking and paddling your little ones arm through the water. The lessons end with a bit of a wind down with the babies floating on their back and singing the end of lesson songs. It is probably clear from what I've written above that Nola and I have been enjoying our Turtle Tots swimming lessons. Our lessons are in a private school pool which means the class has full use of the pool making it a far more relaxed environment than a busy public pool. The changing room can be a little cramped depending on how may people attend the lesson but thankfully the lack of space hasn't been an issue. What I'm impressed with most is the progression within the lessons and the activities which promote those important swimming skills. 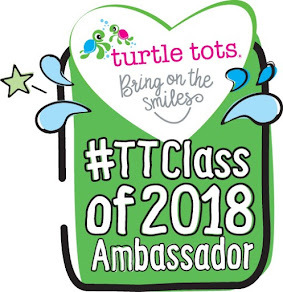 If you're interested in swimming with Turtle Tots head over to their website to find your nearest class.